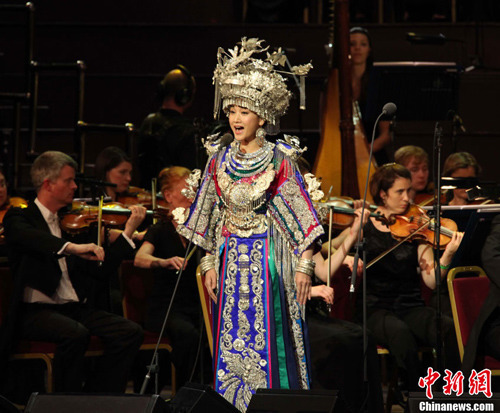 LONDON, June 5 (CNS, by Wei Qun, Yang Chun)-The "East Meets West-Three Stars in Collaboration" Concert was held on the evening of June 5 at the Royal Albert Hall, London. Famous Chinese singer Song Zuying, young pianist Lang Lang and the well-known Italian tenor Andrea Bocelli performed classic Chinese and Western songs in collaboration. With the wonderful performance of the three artists, the concert was full of highlights. Under the direction of Chinese conductor Yu Long, the British Royal Philharmonic Orchestra and Royal Philharmonic Choir performed the traditional Chinese folk song "Jasmine Flower", which opened the prelude to the concert. After that, Song Zuying went on stage first. In addition to some of her hits, she also made debut of a new song, "Guan Ju". 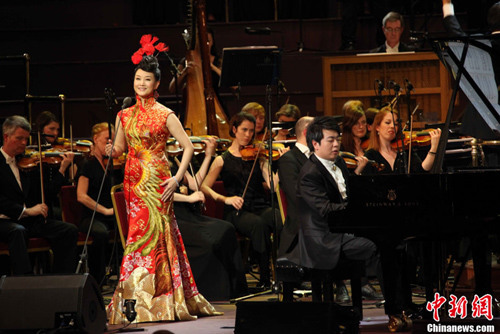 To add to the atmosphere of London Olympics, Ms. Song also performed "You and Me", the theme song of the Beijing Olympics, in collaboration with Lang Lang. Song said in a news conference prior to the concert that she was very pleased to bring the sincere good wishes from the Chinese People to the British audience on the eve of the London Olympics. If Song Zuying's singing represents the wonderful Chinese culture, then Lang Lang and Andrea Bocelli presented a feast of the Western culture. Lang Lang's interpretation of Chopin and Andrea's solo received from the audience rounds of applause and cheers. The Chinese folk song "Kangding Love Song" performed by Ms. Song and Mr. Bocelli in Chinese and Italian with the accompaniment by Lang Lang brought the concert to its highlight. Finally the concert ended with the "Farewell Moment" performed by the three artists together and an encore, the Scottish folk song "Auld Lang Syne". Ms. Song Zuying undoubtedly was a focus at the concert. She appeared at the stage in four gorgeous dresses. In the opening of the concert, Ms. Song appeared in a bright yellow costume with flower theme. It was the work of YEE Chung Man, a master fashion designer in Hong Kong who was once nominated for the Oscar Best Costume Design. Then came the most eye-catching one:a bright red cheongsam with gorgeous embroidery of phoenix. It was designed by Guo Pei, a famous fashion designer who designed the formal dress for award conferring at the Beijing Olympic Games. After that, Ms. Song performed a Hunan folk song in the silver studded traditional Miao ethnic costume. It was the performance with the most distinct ethnic style at the concert. The final focus at the concert was a silver-white costume with inset. It was a "surprise" specially prepared by a well-known French fashion designer for Ms. Song for the London concert. After the performance, Mr. Wang, a Chinese working in the IT industry, told the reporter that the artists presented a high-quality and creative concert. He said that "The Chinese folk songs of Song Zuying have brought the feeling of hometown to the Chinese in London." British audience Mr. Gates, a police officer, believed that the concert was a great success and the performance of the Chinese artists was impressive. He hoped that there would be more cooperation between Chinese and foreign artists in their performance. Madame Raffdy from India said that the concert was "vibrant". She liked the three pieces of music performed by the three artists together the most.